Film Tour Arcade Machine is a ticket redemption game which uses a classic cinematic / film theme for the cabinet design and artwork. How to Play: -Players simply insert their coins into the machine; -Then they use the clapper styled lever control, and snap the clapper to start the wheel; -The wheel turns and where it stops, players will receive tickets equal to what is shown! This fun and attractive looking cabinet also uses a number of operator customisable features such as rate, allowing this machine to suit and earn well in a wide variety of locations. The game also uses a unique feature where players can earn up to 4 different kinds of tickets! This surprising and simple game is fun for players of all ages, and it's bright LED lit cabinet - which features a classic rolling film projector thatshiones brightly for the marquee - stands out on any floor, attracting players from every corner of the location. The wheel turns and where it stops, players will receive tickets equal to what is shown! This fun and attractive looking cabinet also uses a number of operator customisable features such as rate, allowing this machine to suit and earn well in a wide variety of locations. The game also uses a unique feature where players can earn up to 4 different kinds of tickets! 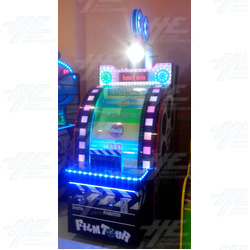 This surprising and simple game is fun for players of all ages, and it's bright LED lit cabinet - which features a classic rolling film projector thatshiones brightly for the marquee - stands out on any floor, attracting players from every corner of the location.